A Chechen national named as the brains behind the Istanbul terror attacks had reportedly fled Russia some 12 years ago to win refugee status in Austria, which helped the terror suspect repeatedly avoid extradition to his home country. Turkish media cited police sources as saying that Ahmed Chataev, a Russian citizen of Chechen origin who had joined the Daesh terror group in 2015, was the organizer of the triple bombings and gun attacks that killed 44 people and injured over 230 others at Istanbul’s Ataturk Airport earlier this week. No group has claimed responsibility for the assault, but authorities in Ankara say evidence is growing that Daesh was behind the carnage. On Thursday, a Turkish official said the three bombers were from Russia, Uzbekistan and Kyrgyzstan. However, he stopped short of identifying the trio. A CCTV image of the three of them walking into the airport together has been made public. Ataturk Airport in the Turkish city of Istanbul on June 28, 2016. According to Deputy Chairman of the Russian Investigative Committee Andrey Przhezdomsky, Chataev was a senior Daesh commander tasked with creating terror cells to be sent to Russia and West Europe, Russia’sKommersant newspaper reported earlier this year. In January, Russia’s National Anti-Terrorism Committee announced that Daesh terror cells led by Chechen recruiter Chataev were planning terrorist attacks in Russia and Europe. According to the United Nations Security Council, Chataev has now 130 Daesh terrorists at his disposal in Syria. Thousands of recruits from the republics in Russia’s North Caucasus region have joined the ranks of Daesh in Syria in recent years, usually reaching the Arab state via Turkey. Chataev had been on a Russian wanted list for terror charges since 2003, but he fled to Europe later that year and won asylum status in Austria. During the Second Chechen War between 1999 and 2000, he joined the militants that fought against Russia and lost his arm during the war. However, he has claimed that he lost his arm under severe torture in Russian custody. Reports say Chataev, known by the nickname ‘One Armed,’ used to send equipment back to the Northern Caucuses for terrorists to use. He spent time in a Swedish prison in 2008 along with a number of other Chechen nationals after police found Kalashnikov assault rifles, explosives and ammunition in his car. Two years later, Chataev was detained in Ukraine, with his mobile phone files containing a demolition technique instruction and photos of people killed in a blast. Moscow filed a request with the Kiev government for Chataev’s extradition, but the European Court for Human Rights ordered Ukraine not to hand him over to Russia. The attackers initially opened fire to create panic outside. Two of them then entered the terminal building and blew themselves up, while the third detonated his explosives at the entrance. At least 44 people, including 19 foreigners, were killed, and more than 230 others were wounded. A second Chechen, Osman Vadinov, has also been named as one of the three suicide assailants. Reports say he had entered Turkey from the Syrian city of Raqqah, the main Daesh stronghold in Syria. Investigators are examining CCTV footage and mobile phone videos to shed more light on the terror attack. They are also carrying out DNA tests on the bombers’ remains. 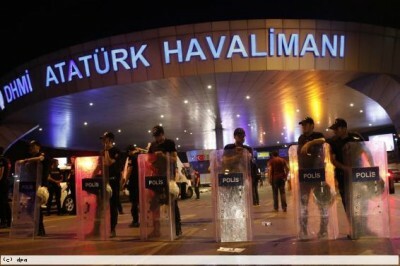 On Thursday, Turkey detained 22 people in connection with the attack.